Conwy to Portmeirion Scenic Drive, Wales | Self-Drive This Classic Route! The drive from Conwy to Portmeirion in Wales is a fairly short one and will take less than an hour to complete no matter which route you choose. Of course, the route through Snowdonia National Park is by far more scenic and worthwhile. 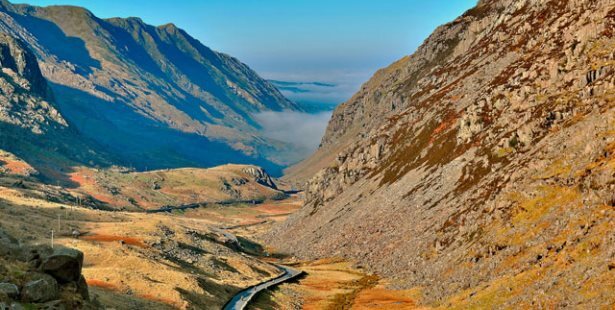 If you are planning a road trip from Liverpool, Manchester or any other fine city to Birmingham, for example, then you should make the most of your drive by taking this Snowdonia scenic route. If you are worried about racking up the miles on your rental car, how about a one way rental? That way, you don’t have to plan or budget for the trip back. This is one of the first national parks in Wales and a very popular destination for tourists and locals. There are a number of mountains in this area including Moel Hebog, Mynydd Mawr and the Nantlle Ridge. The Snowdon Massif, Glyderau; and the Carneddau are also located here and they are the highest mountains in Wales. The area is also home to various forms of wildlife including polecats, otters and the feral goat. A number of bird species also call this park home so keep your eyes open and you might spot a raven, merlin or other rare birds. Before you leave Conwy, make sure that you get your fill of tourist activities! Places to visit include the Conwy Castle, the Conwy Town Walls and Plas Mawr. The Conwy Suspension Bridge, Bodlondeb Woods Local Nature Reserve and Aberconwy House are also top attractions. After setting off on your drive, you will come across a number of wonderful towns. The Bodnant Garden in Tal-y-Cafn is a great place to stop, stretch your legs and have a look around. Further along your route, you will reach Llanrwst. The main attractions in this area include the Y Bont Fawr – Llanrwst Bridge, the 14th century Gwydir Castle, Grey Mare’s Tail Waterfall and religious sites like Gwydir Uchaf Chapel and St Grwst Church. Another great castle to visit as you continue your drive is the Dolwyddelan Castle. In Blaenau Ffestiniog, you can visit the slate mines and the Cellb art centre where you can enjoy a bite to eat, something to drink and a break from driving. Portmeirion is the next main stop that awaits but you can surely stop in between if something catches your eye. Many of the towns on this route have wildlife centres and give travellers the opportunity to get closer to some incredible animals that you ordinarily might not get to see. Driving this route without stopping might be quick but you have so much more to gain just by taking your time. You can even spend the night at one of the cosy hotels or Bed and Breakfasts along the way. Imagine spending the night in these lovely surroundings and breathing in as much of that fresh air as possible.